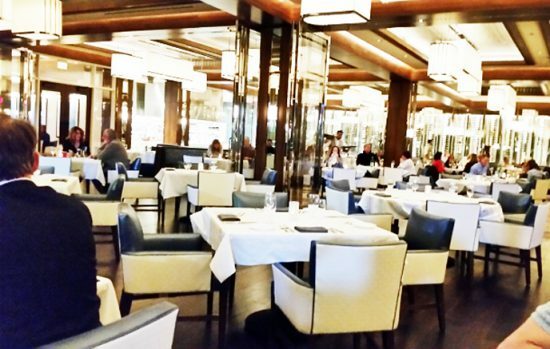 On the ground floor of the Hard Rock Hotel and Casino are several upscale dining options. While the bells and alarms from the casino floor are way off in the distance and the pulsating boom of local bands in various lounges can be heard from across the sprawling and cavernous space, Council Oak Fish is a relaxing place with a bright dining room and availability for eating/inbibing al fresco on the boardwalk during the warmer seasons. The men and woman working at the reception desk greeted us warmly. We felt welcomed and invited. Luis was our waiter. All three escorted us to our white clothe table while a bass guitar and drum roll could be heard from afar. Snow white leather chairs and mirrored pillars compliment the decor with deco-style light fixtures floating above making the dining room appear grand, airy and spacious. Walking to our assigned table, a waft of steamed or fried fish permeated the air; it soon dissipated much to our content. 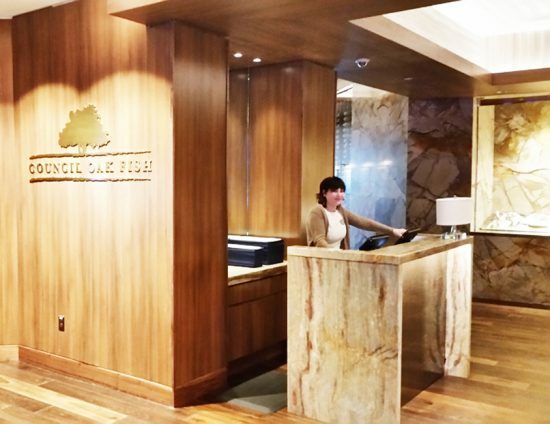 While fish is in the restaurants title, we were strongly encouraged to try one of their stakes. It’s not pretentious but a little bit formal considering the location. It’s perfect for high society and high rollers. The Council Oak Fish appetizers include Oysters from Blue Point, Long Island to Pemaquid, Maine and Cape May Salts, NJ. On this particular visit, Luis suggested the Cioppino – a bouillabaisse/seafood stew that consists of shellfish, tomato, thyme and garlic. It just so happens to be one of my favorite dishes. However, the shrimp was overcooked and the scallops were a little too tender. 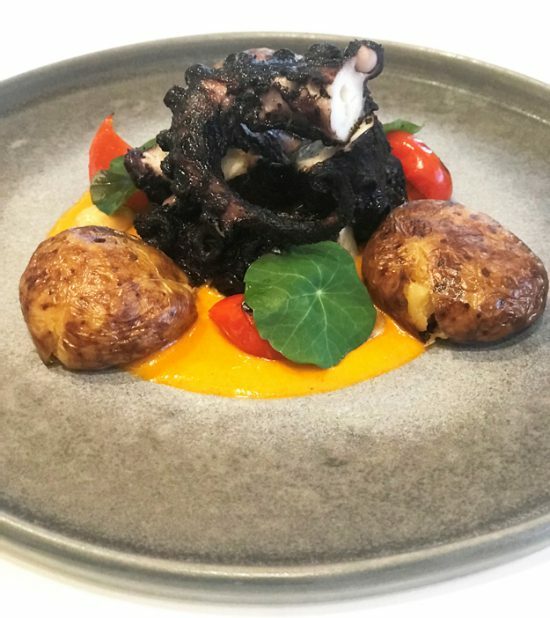 Their grilled octopus (above) looks like a work of art. You will notice that no salt or pepper mills are on the table because the chef believes that he knows what he is doing. No additional seasoning necessary. The menu also includes Shelfish Pots with Maine lobster, shrimp, clams, mussels, andouille sausage, corn and potatoes. 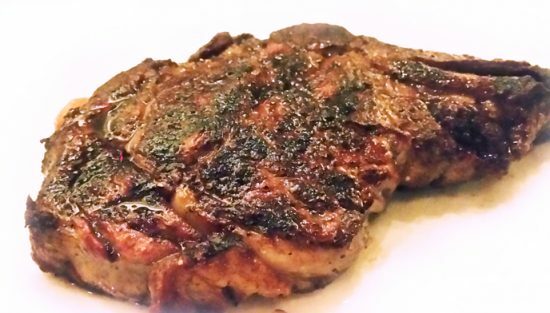 Luis convinced me to try the rib eye steak while my dinner guest chose the New York strip steak. It was a world of difference. While mine was tender and seasoned with a smoky dry rub and enough for two people to consume, his was tough and difficult to slice. In retrospect, we shared my steak but I should have given him ½ of my portion because it was too much for me to finish. Our server, Luis, was congenial, professional and entertaining. He recommended the meat over the fish along with several side dishes. While my steak was cocked to perfection, my dinner partner was less than satisfied about his entrée. We will return to AC and Hard Rock Hotel and Casino to roll the dice at another restaurant. Read about our review on the Hard Rock Hotel and Casino fashion. P.K. Greenfield is a freelance writer: Millennium Magazine, British Airways, Passport, i-Italy, The Wall Street Journal, Hola, The Fabulous Report. Photo Creds: Tony Caliendo, P.K. Greenfield and Hard Rock Inc.